Arches National Park is a photographer's dream come true. Everywhere you turn is a photographic opportunity. The hiking is fun, but the reason to come to Arches is really for the photography. Make sure you understand and know which arches and places are good in the AM and which arches and places are good for the PM. That is extremely important for great photography at Arches National Park. Be sure to bring plenty of water if you visit the park during the summer months as it becomes extremely hot. Arches is more touristy than some of the other national parks. Most of the areas to visit can be done in one day. However, from the photography aspect, unless there's a dramatic sky visiting just two sights a day (sunrise and/or sunset) is about all you're going to get for good photogenic shots. There really aren't many places to "hike" but there are some longer "walks" in order to get to some of the sights to see such as Delicate Arch. 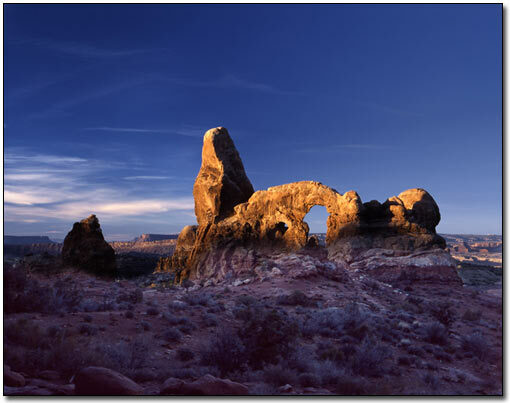 Up at the northern part is the "Devil's Garden" area which is composed of several trails that lead to some arches (Skyline Arch, Pine Tree Arch, Dark Angel Arch, etc.). If you're looking for some good photography then, Arches is well worth a visit for three or four days. I spent five days in the Moab area and didn't get to do everything I wanted to do. I used the town of Moab as my base and I stayed in a "camping cabin" that had both heat and an air conditioner. Showers were available along with indoor outhouses. By no means was it camping out. If you go to Moab, I highly recommend the photographic Art Gallery of Mr. Tom Till. There's also a 1 hour photo lab where they do everything from slides to prints, 35mm to 4x5, color and b&w, in an hour. Very nice people too. With Mesa Arch you'd want to catch the glow of the sunrise. You're on the mesa and actually standing behind the arch facing east! The mesa is about 700 - 800 feet above the canyon(s) with the arch towering above you and slightly hanging over the cliff. When the light of the sun hits the face of the cliff, the rays are bounced upward causing the bottom of the arch to glow as if it were on fire. The arch also serves as a "window" to the rest of the canyon(s) beyond but, the arch is the main star. Delicate Arch is probably the worlds most famous arch. To get there you have to hike about a mile and a half (up hill of course) but it's an easy hike. It's a sunset view. If I were to do it again (which I will), I'd get in the "bowl" to the right (west) of the arch and shoot up at it instead of the straight-on classic view. Carry a flashlight with you for the hike back. BUT!! !...probably the best "morning" sight is Turret Arch. The whole crop of rocks that make up the arch seem to glow when the morning sunlight hits them. Also, the view behind the arch makes for a nice backdrop. The arch is located in the "Windows" section of the park which is an easy drive. If you don't mind an easy climb, there's a nice shot through the "north" window which will frame Turret Arch. I got to the parking area before sunrise. In fact, it was completely dark out with no hint of sunrise. After a short while, a couple of other cars came by with only one stopping. About a half hour passed before the sky started to lighten to the east so, I decided to get out and set up. I scouted the area the day before so I knew exactly where I wanted to set up. After a short hike I planted my tripod smack-dab in front of the 'North Window' and got to work. I used my Mamiya 645 with a 210mm lens and an enhancing filter with polarizer attached to the front. Just as the sun started to crest the eastern horizon I began to shoot and ended up going through two rolls of 120 film. I used a graduated neutral density filter on most of the shots so the foreground wouldn't be totally black and still not have the arch washed out. The guy in the car that stopped was also set up but he only took two shots and was gone shortly after he finished so I had the the entire 'Windows' section to myself. Course, I had my dog Sam with me and she got in quite a few smells of the vicinity and when she was satisfied making her sniffing tour of the area, we packed up and left. Also, take the hike to Skyline Arch before it collapses. Did you know Skyline Arch is the original Delicate Arch? When they made the maps up they accidentally mislabeled them. I hope you have a great time photographing Arches National Park.